Act for Wildlife is a community of conservation experts and enthusiasts, led by Chester Zoo. They are taking action to protect the natural world and leading the way in saving endangered wildlife. Act for Wildlife strongly believe that every one of us can help and that together we can make a big difference. Their campaigns encourage everyone to act right now, to make a global impact. Act for Wildlife originally began life as a single conservation campaign. However, it quickly grew bigger and bigger, eventually becoming its own entity. Our main purpose then, was to explore and define their core values. They needed to convey authority, expertise and collaboration. Most importantly, it was all about real people on the ground making a difference. With the core values established, we needed to guide the charity on how to best develop and utilise them- a brand repositioning. This was to be done through brand guidelines. 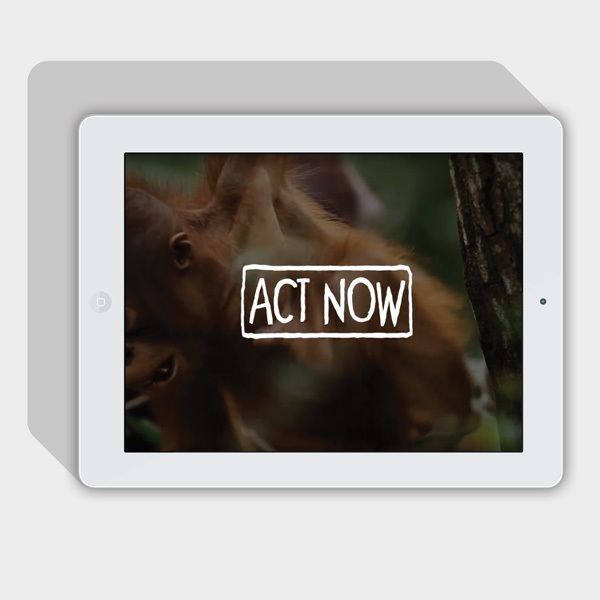 For example, Act for Wildlife wanted to see more flexibility within the brand style. By widening the colour palette, they’d be able to choose the most suitable colour for each branding situation. Additionally, they wanted greater guidance on how to present the brand through imagery and film, recognising the massive impact that these formats can have on an audience. Crucially, Act for Wildlife had to remain distinct from Chester Zoo. This is an equal partnership and the language and imagery needed to reflect that. With the charity’s projects taking place within and outside of the Zoo, Act for Wildlife has become the key link between the Zoo’s cutting edge research and the wider global situation. As a charity, it is imperative that the Act for Wildlife brand inspires people to take action right now. Donations are vital to the charity’s work so the brand truly had to motivate people and educate them on the dangers facing global wildlife. Act for Wildlife’s personality needed to come through strongly. This is a charity full of experts, who can talk authoritatively on their specialist fields. These people needed to be highlighted, their work lauded, and their findings promoted. Act for Wildlife and Chester Zoo work closely together on numerous projects. Act for Wildlife’s brand needed to acknowledge this relationship whilst retaining its own individual identity. As with all the branding work we do, our first action on the Act for Wildlife brand repositioning brief was research. By looking at other charities and their brand guidelines, we gained a better understanding of how they articulate their purpose to the world. Recognising the multiple aims of the Act for Wildlife brand, our research covered zoos and charities alike- the WWF, San Diego Zoo and charity: water. Having completed our research, we focused on tying down the Act for Wildlife brand. In creating this set of brand guidelines, we acknowledged that they will be used by a wide range of people, each with different requirements. From the Zoo’s Digital Marketing Manager to any freelance designer or writer. As a result, they are self-explanatory and provide an excellent overview of the brand. We have covered both the visual elements of the brand and the less tangible areas, such as tone of voice, always being as clear as possible. For example, we specifically state that any image of an animal must show it within the natural element. Act for Wildlife needs to show that critically important connection between animal and environment, and how significant the relationship is, in order to promote their message. With the brand values and identity established, we began to roll out the various elements into physical collateral. We produced four separate adverts for print, which were then published in the Guardian and the Observer. Undoubtedly, however, our favourite aspect of this project was creating a 90 second brand video, highlighting the Act for Wildlife brand values. It contained strong statements, including ‘We’re on the brink of losing incredible species forever’, which were all geared to evoke emotion in the audience. We interspersed scenes of habitat destruction with images of animals in their natural environments, further reinforcing that connection. This video was a quick method of communicating and further establishing the brand values and has been used widely. Our brand repositioning of Act for Wildlife is proving enormously successful. With a solid set of brand values and a defined identity, everyone at Chester Zoo is far more aware of the charity’s work and purpose. Subsequently, this has helped them put forward a motivating, informative message through the most suitable manner for each situation.